Do you have a website that takes booking or manages events and you want to sell tickets? 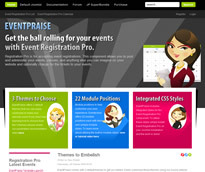 If you do, you might very well be using Event Registration Pro and if you are, there is now a new theme for this extension, provided by JoomlaPraise. Now, while this theme was built for this extension, it also works and looks perfect without the extension installed, but with this extension, it does sort of fill all the gaps. Well worth the investment if you've made the investment for the extension. The theme comes with three themes that you can easily customise to make your website yours! If you need help learning how to choose from the themes JoomlaPraise have a parameters documentation video. It also comes with four header background options, 22 module positions and the source code, as well as loads of information on how to make the website unique and how to get the most out of it. Click here for a demo or more information of the theme and if you are interested in the extension, click here.